Occasionally I get questions like, "Where do you write? or "What is your process like?" These are good questions from people curious what sorts of disciplines separate someone who likes to write from someone who doesn't. There is certainly no universal answer for all writers. Some choose to write every day with religious fervor, whether they feel inspired or not. Other choose to write at certain hours of the day, in certain rooms. Still others need music or coffee shop noise to get their writing done. I'm guessing that perhaps the majority in this day and age use a computer or laptop to get their thoughts down. With the advantage of spell check, cut and paste, and the ability to write almost anywhere (indoors) with a laptop, some find it easier to work strictly digital - nothing wrong with that approach either. So what methods do I use and when do I write? desktop. What you see here is a an example of what that looks like. Ain't it beautiful? You see every scar, pimple and wart on the original transcript without my ability to hide any of it. This was how much of the Dirty Shirt book was written - at least the early first drafts. 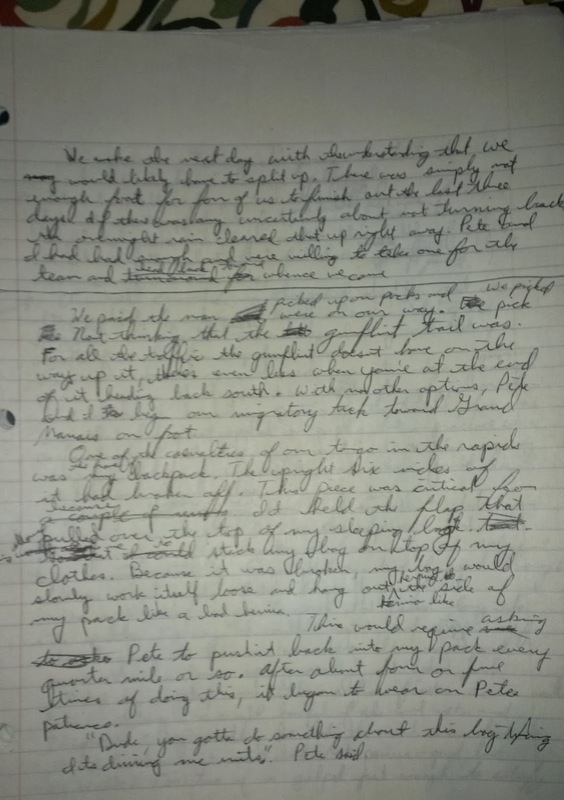 If I had hoarder tendencies, I would squirrel away these pages in hopes that someday when I'm finishing up my tenth book, I would come across these pages with fond remembrances of my early techniques and scrawlings. Sort of like coming across the original words to "Help" by the Beatles on the back of a bar napkin or something. While I used to write the "hard way," now I do almost all of my writing on the laptop. This gives me freedom to do it in the comfort of my living room, often times with one or more other family members in the same room with me. We never have the TV on, so it is kind of a detached attachment for all of us. My wife does a lot of her work from her laptop across the room from me and as pathetic as it may sound, it is how we roll. It is together time, and we frequently interrupt each other to talk or joke about something we've seen or heard. To us it's no stranger than sitting together watching some stupid sitcom, and at least we're getting something done. So while I write almost every day, my one sacred indulgence is a two hour window on a Saturday. This is when I go to a local coffee shop and get my most productive work done. I've become dependent and protective of those hours, sort of like going to work, without going to work. I need to be there. I want to be there. If I'm denied it, I get resentful. It's part of the reason I work like a dog in the morning hours around the house, so that I can get a couple hours away to pen my thoughts. major events and memorable occasions with both of my kids when they were born. 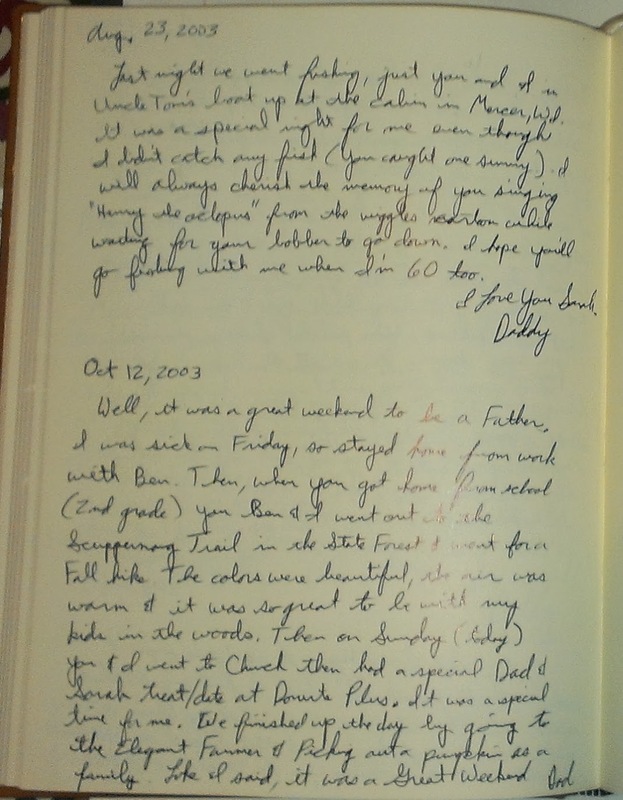 It was my plan to give them the journals when they went away to college, but am rethinking that now again, since Sarah is about ready to embark on that. I don't think I'm ready to stop and admit that she's leaving. So until I do, I'll keep plugging away at this book - still what I consider to be my most important works, when all is said and done. That in a nutshell is when and how I do it. Between all of those methods and routines, as well as this blog, I keep myself sharp. With all of it, some pieces are better than others, but all of it needs to happen. It is part of who I am.